Let me show you a few tweets from recent days, because y’see, I think we have a problem within ‘public health’ debate that needs to be solved. 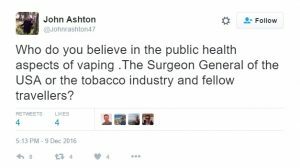 This is with regard to last week’s appalling US Surgeon General report on e-cigarettes which had more holes in its ‘evidence’ than a Swiss cheese…. There is a legend that if the Pope sits in the chair of St Peter, he is on a direct line to God and can truly speak the word of God. It’s a handy trick as all the Faithful have to believe him no matter what he says ex cathedra. 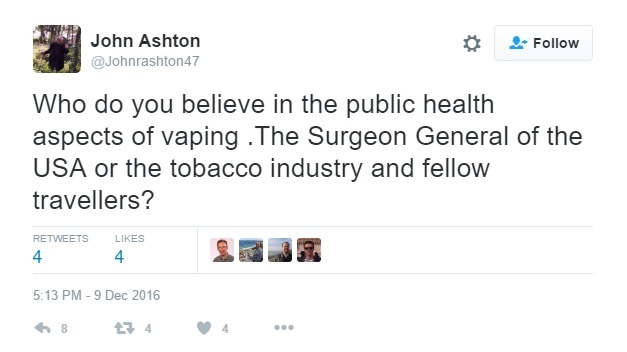 There is a remarkable similarity with the American Surgeon General…. In February this year, the Supreme Administrative Court ruled that e-cigarettes are not a medical class products, and therefore they should be regulated in the Swedish law on the basis of the EU’s Tobacco Products Directive. The state investigator then proposed a fast track with a proposal for a law that would take effect on 1 October. The proposal included, among other things, the 18-year limit, a permit rquirement for the sale, exposure bans, and bans on attractive flavors. In this pilot longitudinal study, Wadia et al. examine the effects of vaping on the gingiva and inflammatory biomarkers. The study recorded the gingival health of smokers before and after switching to vaping. They expected to see no change in gingival health because of previous studies suggesting that reduction in bleeding was due to the induction of gingival vasoconstriction by the nicotine component of cigarette smoking. Anti-e-cigarette alarmism reached fever pitch Thursday, with the release of the surgeon general’s first-ever report on youth e-cigarette use. 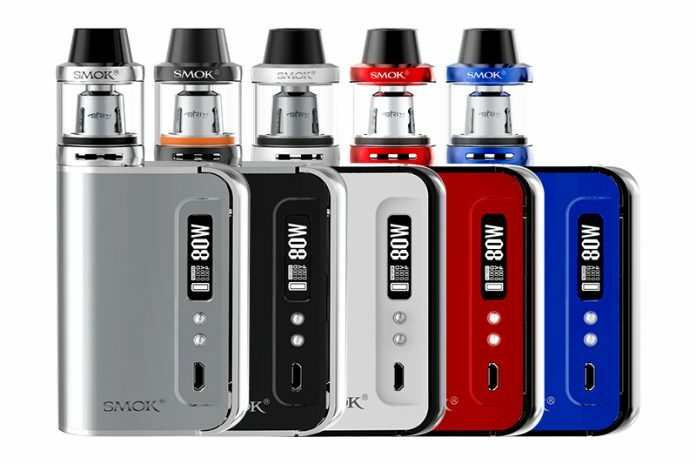 Although the US Surgeon General has taken electronic cigarettes (e-cigs) very seriously and called them a “growing threat to the health of young people,” the Health Ministry in Jerusalem has not. In fact, it did not even include the use of e-cigs in its MABAT survey of the health practices of 6,274 junior and senior high school pupils released last week, but only the smoking of cigarettes and nargilas (hookahs, or water pipes). By which I don’t just mean I’m happy for friends and strangers to smoke in my house, my car or my place of work, and that I was happy about this before, during and after the 23 years I smoked myself. I mean that their decision to smoke, or not, is theirs. And theirs alone. It used to be an obvious statement. If you’ll allow me to drift into foreign for a moment, Laissez-faire was de rigeur. But not anymore…. The Association of Multiple Licensed Retailers has responded to the Welsh Government’s decision to amend plans for a ban on e-cigarettes in public places.